From transport accidents involving hazardous compounds, to the mishandling of household chemicals, or the deliberate release of hazardous materials, fire department crews across the country need to be equipped and trained to respond to a myriad of potential HazMat events. So just how prepared do firefighters really feel when it comes to responding to the unique challenges of HazMat incidents? In a bid to answer this question, the online resource for fire professionals, FireRescue1, conducted a survey of its readers to gauge their views on the best ways to achieve safe and effective HazMat response. The survey drew on the experiences of 250 firefighters and comprised a combination of serving officers, volunteers and municipal agents. More than 90% of respondents were US or Canadian fire safety personnel, with a handful originating from eight other countries including Saudi Arabia, Venezuela, Sri Lanka and Ghana. This blog post summarizes the key findings of the FireRescue1 report and highlights the crucial areas where fire crews believe there is still room for improvement. How confident do fire crews feel? Just under half of the survey's respondents stated that they felt "adequately prepared" for HazMat incidents. Sixty-eight percent of respondents said that they rely on local standard operational procedures (SOP's) for HazMat response. What's the annual frequency of HazMat calls? 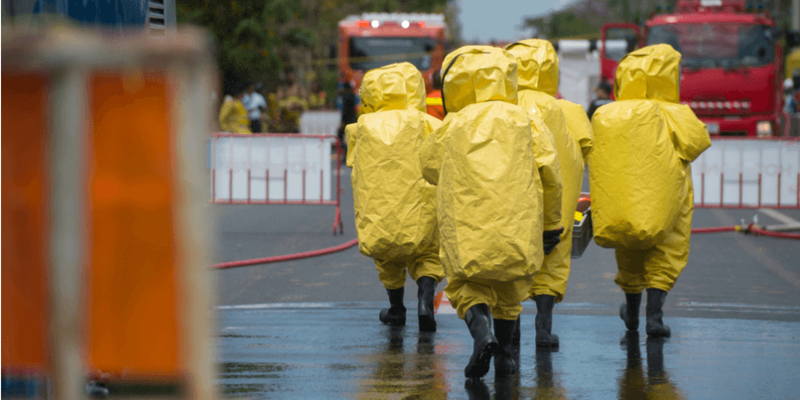 Fifty-eight percent reported that the average frequency for HazMat incidents was one to four times per year, with 21% reporting calls between six and twelve times a year. Eighteen percent indicated they were required to respond to HazMat calls more than once a month. While a mere three per cent of those surveyed reported that they'd never been required to respond to an incident involving hazardous materials. How can HazMat response be improved? The top three needs for HazMat response were listed as: further training (70%), additional funding (64%) and greater access to detection tools (46%). The importance of HazMat training has also been highlighted in a separate FireRescue1 article authored by professional firefighter Jim Spell, in which he describes the benefits of training at the awareness and operations level and the value that the higher tier of technical training provides for firefighters. Detection or identification technology was identified as a significant factor for the majority of respondents. Fifty-eight percent of personnel reported that they rely on the use of detectors in order to determine the nature of a substance or substances encountered in a HazMat incident. Just over a third (35%) of respondents highlighted accidental exposure to the powerful and illicitly manufactured synthetic opioid, fentanyl, as one of their biggest concerns when it came to maintaining personal safety in the line of duty. Fentanyl is well documented as posing a substantial threat to fire and EMS personnel when accidentally ingested or inhaled and US fire departments have recorded a string of 'close calls' in recent years. Street versions of fentanyl are known to take on many forms - including powder, spray, pill or blotter paper - and are reported to be 30-50 times more potent than heroin. As the FireRescue1 report reveals, while HazMat incidents tend to be lower in frequency in comparison to other fire department calls, they are nonetheless high-threat events that can have huge consequences. Safe and successful resolution relies on a measured and deliberate approach from fire crews. And on personnel having access to the right training and the right equipment.